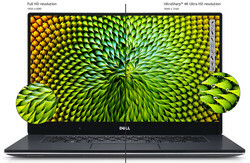 This autumn Dell introduces four new versions of the XPS 15 with InfinityEdge display as well as seven different configurations of the popular XPS 13. The following article is a commented overview of the available versions. Which configuration is recommended for which scenario? 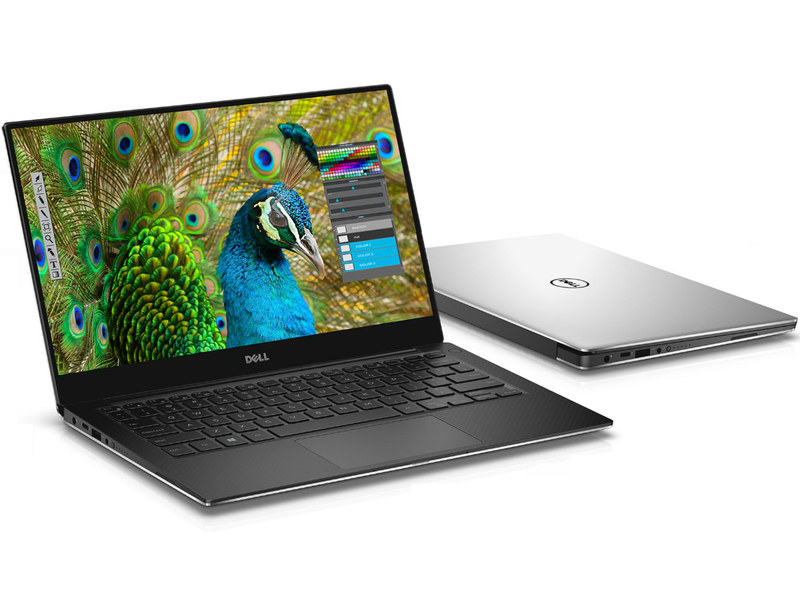 Dell customers will have numerous versions of the updated Dell XPS 13 (Dell XPS 13 Broadwell here in review) and the new XPS 15 with InfinityEdge display to choose from. Dell XPS 15 (Late 2015) "InfinityEdge"
We start with the revised Dell XPS 15. 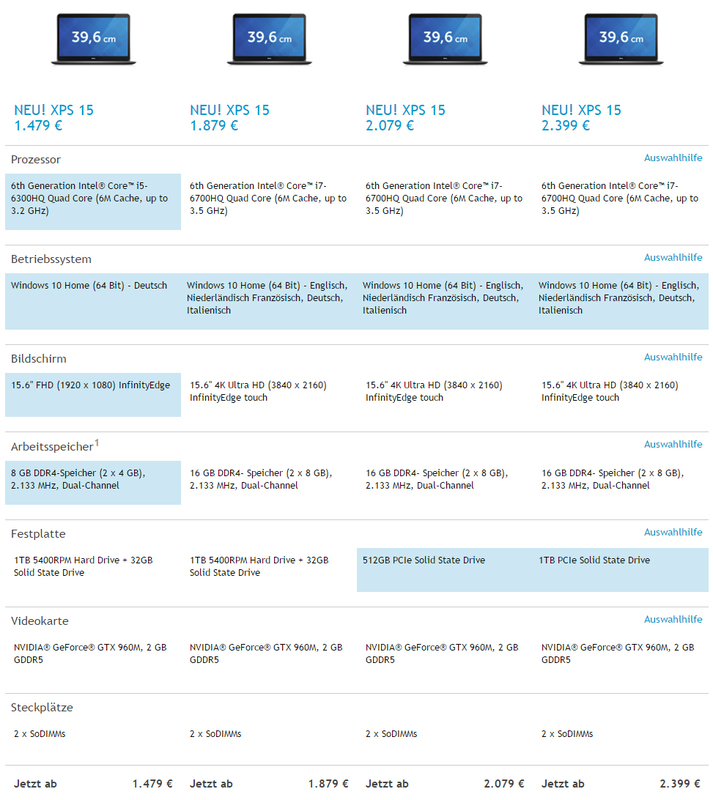 Currently, there are four different configurations from Dell in the German online shop. Prices start from 1479 Euros (~$1679) all the way up to 2399 Euros (~$2723), but this is only for the hardware. You can increase the prices significantly by warranty extensions, software and various accessories (only 1-year standard warranty). The main criterion when selecting a configuration is the choice of the correct display. You can choose between an FHD panel with 1920x1080 pixels (141.2 PPI) and the 4K Ultra HD display with 3840x2160 pixels (282.4 PPI). Apart from the resolution, the displays also differ in terms of the screen surface. The FHD panel has a matte coating, while the 4K display has a glossy surface. The latter also supports touch inputs while the FHD version does not. 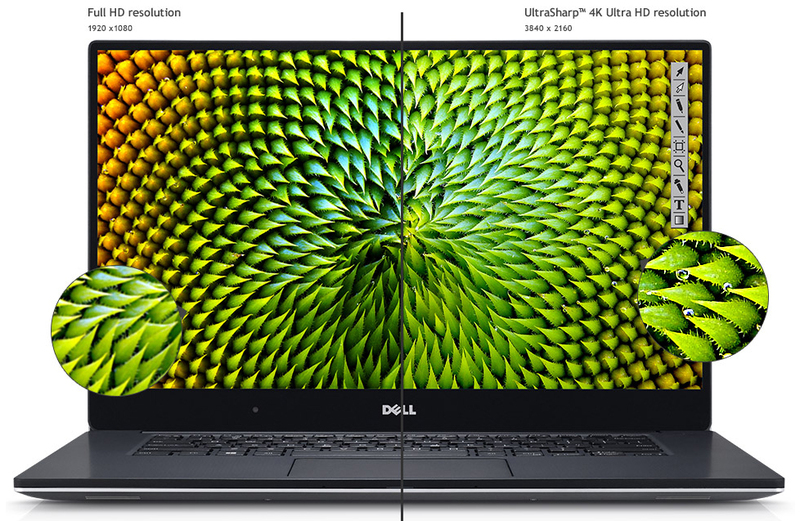 If Dell once again uses the familiar 4K IGZO IPS display, which was already used for the predecessor (here in this review), users can expect a luminance of up to 400 cd/m², a contrast of 1000:1 and a surprisingly good color accuracy ex-works (sRGB reference). We are eager to check the AdobeRGB coverage since Dell promises more than 100%. This was, however, not the case for the predecessor. The 4K screen is the better choice for video and graphics enthusiasts, while users with a focus on office applications should be better off with the matte FHD panel. It will have an advantage in mobile scenarios in particular due to its anti-reflective surface. Nevertheless, we recommend waiting for our reviews of the two screens, before you select the display most suitable for your needs. By the way, the Full HD version is "only" available in combination with the i5-6300HQ CPU and 8 GB memory. Price: 1479 Euros (~$1679). Dell offers options for the processor, memory and storage devices, while every model gets the Nvidia Geforce GTX 960M with 2 GB GDDR5 video memory. This is a powerful upper mainstream or entry-level high-end chip. Except for some complex games, the chip is usually powerful enough for smooth gameplay in FHD and high details. Gaming in 4K on the other hand is too demanding for this graphics solution. There are two processors you can choose from, but they are linked to the display choice. The FHD model gets the i5-6300HQ, which seems to be very interesting from a price-performance point of view, while the other three configurations with the 4K display are always equipped with the Intel i7-6700HQ. Both chips are native quad-core processors, but the i7 supports Hyperthreading with four additional virtual cores. The i7 has slightly higher clocks. In a first comparison based on known benchmarks of the i5-6300HQ, we can see an advantage of up to 50% over the previous entry-level CPU of the XPS 15, the i5-4200H, in the multi-core Cinebench test. Based on the test, the Intel i7-6700HQ on the other hand does not have such a big advantage over the i7-4712HQ in the old XPS 15. The memory is also linked to the display (FHD: 8 GB, 4K: 16 GB). However, Dell uses SODIMM modules, so you might be able to upgrade the memory later. The selection of the storage drive simply comes down to your expected requirements as well as your wallet. The standard solution is a conventional 1 TB hard drive in combination with an SSD cache, which is not recommendable. We would recommend a version with a PCIe-SSD to ensure a snappy system. The additional cost of 300 Euros (~$340) for the standard configuration seems a bit steep, but corresponds roughly with the current market price of a comparable flash storage. The same applies to the 1 TB SSD for an additional 320 Euros (~$363). The choice of the right model of the updated XPS 13 could be more complicated, because there are now seven configurations. Unlike the XPS 15, the XPS 13 is targeting mobile users that have just as high expectations for the performance and quality, particularly in terms of the display. As with its predecessor, Dell lists two display versions: A matte FHD panel with 1920x1080 pixels (165.6 PPI) and a UHD panel with a resolution of 3200x1800 pixels (276.1 PPI), both as InfinityEdge with a very slim frame. Considering the specifications, you can expect the same panels that were already used in the predecessor. Both the matte FHD version as well as the high-resolution Quad HD+ panel managed good results in our reviews with a maximum luminance of around 400 cd/m², a contrast above 1000:1 and accurate colors (sRGB) ex-works. Once again, the choice between the FHD and QHD+ panel comes down to your planned usage scenario. If you mainly use office applications and use it a lot on the road, then we would recommend the ergonomical FHD version, while users of multimedia applications could benefit from the higher pixel density as well as the touchscreen. We will also cover both versions of the updated XPS 13 in our review. You can get the FHD display in the less expensive configurations in combination with the i5-6200U CPU or the i7-6500U, 4 or 8 GB of memory as well as 128 or 256 GB SSD. The prices for these versions are between 1149 and 1379 Euros (~$1304 - ~$1565). 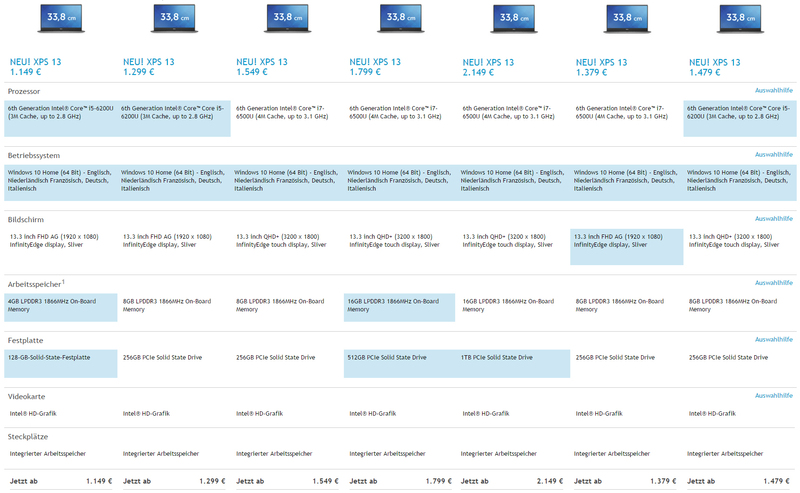 There are five different processors listed in the specifications (i3-6100U, i5-6200U, i5-6300U, i7-6500U and i7-6600U), but only two models are available in Germany. The entry-level chip is the i5-6200U, which replaces the i5-5200U of the predecessor. Performance enthusiasts can get the i7-6500U, the predecessor of the i7-5500U or the i7-5600U, respectively. According to the initial benchmarks of the new i7-6500U, the performance gains over the i7-5500 and i7-5600 in the previous XPS models are very small at just a few percent. Unfortunately, there are no results for the i5-6200U yet, but you can expect a similar advantage for the i7 over the i5, which was already the case for the predecessor. This would translate into roughly +10% for the CPU in multi-core scenarios. Office users can safely choose the i5. The i7 will only be noticeably faster in extreme situations if at all, and this will only be the case if the chip can maintain its full performance. We will have a look at this in our reviews. In addition to the display and CPU, the amount of memory and storage could be another important aspect when you select a configuration. The XPS 13 will be shipped with 4, 8 or 16 GB of RAM. It is soldered to the motherboard so there is no chance of upgrading it, which means you should consider some headroom. The 4 GB version is therefore not recommended, while 16 GB might be interesting for some users with special applications (Photoshop, virtualization). We recommend versions with a 256 GB SSD (PCIe) or more depending on your requirements. Interesting: Dell charges 250 Euros (~$284; plus 8 GB memory) for the jump from 256 to 512 GB, and 350 Euros (~$397) from 512 GB to 1 TB. Based on the current configuration, we think that the package with the i5-6200U, 8 GB of RAM and a 256 GB PCIe SSD in combination with the matte FHD display is the most interesting version for price-conscious office users, while multimedia users could be happy with the QHD+ version with the i7-6500U CPU, 16 GB of RAM and 512 GB PCIe SSD. Dell advertises a runtime of up to 17 hours for the new XPS 13 (MobileMark 14, adjusted settings) and up to 14 hours video playback or 7 hours web browsing, respectively. The battery capacity has been slightly increased from 52 to 56 Wh. We determined up to 10 hours for the FHD predecessor in our Wi-Fi test, while the models with QHD+ display did not last that long. It can be expected that the new XPS 13 with Skylake processor will manage between 7 and 10 hours in practice depending on the components. We will provide the final results in our upcoming reviews of both display and CPU versions.